Interview done in 2005. Memorable quote: Testing is like flossing–good for you but most people don’t do it. Interesting article on why Google engineers think Windows Defender is best antivirus software. DHH Rant and is TDD dead? 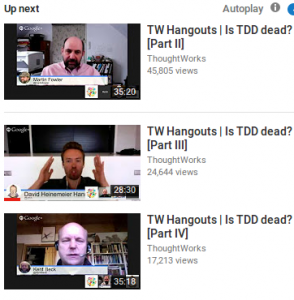 I watched DHH (David Heinemeier Hansson) rant about TDD being overkill sometime ago, and caught up on the chats he had with a couple of it’s creators, Kent Beck & Martin Fowler over the last week. David had his point: creating multiple lines of test code for one line of real code is overboard, but that’s not what Kent had in mind when he created TDD for himself. It’s a much more nuanced conversation to hear the programmers talk it out. It’s also interesting to note that I also listened to Kent talk about his time at Facebook, where no one was interested in his TDD method and extreme programming ideas, and he had to learn about Facebook’s different programming environment. And Uncle Bob (Rob Martin) chimed in with a lot of insight (he’s delightfully intelligent) in another video I was watching over the weekend about being at the conference in Colorado where the Agile Manifesto was created–stating that it was the manifesto was due in part to a reaction to a previous generational event–because the number of programmers was doubling every five years, the waterfall process was invented to give discipline and process to the young guns coming out of college who didn’t know much about programming. Author Michael HPosted on February 13, 2017 February 26, 2017 Categories techLeave a comment on DHH Rant and is TDD dead?